@Hobbyist: What’s your favorite way to store your dried and cured herbs? Do you use Mason jars or C-Vaults? Turkey bags or Food Savers? Vac seal or nitrogen seal? Do you use Bo Veda packs or Integras (or any reverse dessicant for that matter? Let’s chat curing and storage solutions! Mason jars. Thats how I cure them. They stay fresh. I love Mason Jars! 15+ years of dedication to my Masons…until I tried out C Vaults. Have you ever given one of these babies a whirl? In the high desert where humidity at harvest time is @10 percent curing process is critical. Storage is in Mason jars and burb them regularly has worked great for me. What is a c vault? I havent, but they look awesome. Stainless. First time grower here, I went with gallon sized double channeled sealable bags… but not very impressed. I sucked the available air in the bag and created a small vacuum but either the plastic itself is porous or the seals didn’t hold the vacuum. I would like to know what is the recommended water moisture content that you should keep the bud at for curing and storage? I’ve heard of those bags that keep the relative humidity at a constant 62% or 58% but WHY those two RHs? Why not 70% or 59%??? Or 50%? Is it dependant on the RH of the curing environment? Lastly, for those of you who distill your cannabis, why not just take fresh bud and run it through alcohol, use a rotovap to get rid of all the nastiest stuff and then store oil barrel sized drums of concentrate as an oil? That’s what has been driving me mad for months now. Thanks I’ll have to try c vault this year. There’s just nothing like popin the seal of a Mason jar though. It’s a tradition. Welcome mooo. I have been long time advocate of glass no plastic. Look forward to growin with you. I’m sun grown organic. you dont want you bags sealed “airtight”. Think of the curing process like the ripening of a banana. There is a set time (assuming all variables are correct) when the banana ripens from a tough, tart apparatus to a sweet fruit. Day 7 — 10’ish: 73–75 degrees and 45% humidity, until they pass the snap test. Step 1: After your buds are properly dried, you’ll put them inside your turkey bags. Again, you can use Mason jars, but turkey bags work so well because they’re clear and large enough to hold more than a pound of buds. They also breathe a little better than Mason jars allow. Whatever you use, you’ll only want to fill the container about 75 percent of the way, leaving a little room for air because it helps break up sugars and byproducts that are released from the breakdown of chlorophyll in the buds as part of the curing process. This is what makes for a smoother product. TIP: Do not stuff the buds in. You want them loosely stacked. You don’t want to deform or crush them and you need air/space around them. Leaving a quarter of your container empty toward the top will help make sure you follow this tip. Put the lid on the jar or seal the bag and place in a cool, dark place. Step 2: If you’re using a hygrometer, then you can put it inside your bags to measure the humidity and temperature. The ideal environment for curing is around 70°F (21°C), with 50–60 percent humidity. If you’re operating in anything more than a moderate climate, it’s a good idea to measure the temps and humidity in this manner. Step 3: For about 1–2 weeks, you’ll want to check your buds at least daily for mildew and mold (or even many times per day if you think they may still be too wet). You’ll also want to “burp” your buds. This involves taking them out of your container to inspect them, then putting them back in after you’ve removed any that seem to have problems. Changing their position in the container like this should help them cure more uniformly. You don’t have to keep them out long; just long enough to inspect them and let them air out a bit. Step 4: After two weeks or so, you only need to open the curing containers about once per week, not daily. The longer you cure them this way, the better the buds up to about six months. Any longer and you probably won’t improve the quality much more. You can always sample small amounts during your curing process to see if you think your product is ready for market. For years I’ve read that curing was best done in jars and have always done so. Then I recently watched a video on YouTube (New West Summit 2018) where Ed Rosenthal said that it shouldn’t be cured in jars or a sealed environment unless the moisture could be taken away without re-opening the container. Something to do with mold etc. So CVaults and using those 2 way humidity packs might be my next move. Ed even says to stay away from jars in this article on his website. Drying and curing cannabis flowers takes time and patience, but the finished buds are worth the wait. My location at harvest time ( I grow outdoors) average humidity @10 percent much different process. Great opportunity to practice patience. I live in New Mexico, so for me the drying process has been fairly easy (my indoor grow has a bit of space set aside just for drying and it’s been working great for me). When I get to the cure, I’ve been using Mason jars for the last few years. I stumbled upon the blue tinted ones locally and later some of the amber jars, so these are my go to for storage right now. I’ve noticed that the buds I store in the amber jars end up with a smoother smoke than the blue jars (it might just be that I tend to put my better harvests in the amber ones, since I’m limited on them and have more of the blue ones). I put about 28.5 grams in each jar, I don’t use the amount of empty space to figure out how much should be in there; this leaves me with anywhere from half the jar filled to about 80% depending on density. Once the buds are ‘curing’, I put them in a beverage refrigerator set at 40 degree’s Fahrenheit. First the jars sit on their side for about a week, then I rotate the jar to see how things look compared to when I first put them in… I’m not sure how to describe in words how I determine it’s ‘ready’, but when it is ‘ready’, I stand the jar up normally and leave it in there for at least another week. After at least 2 weeks in the fridge, the jar of buds should be ‘ready’ for use. 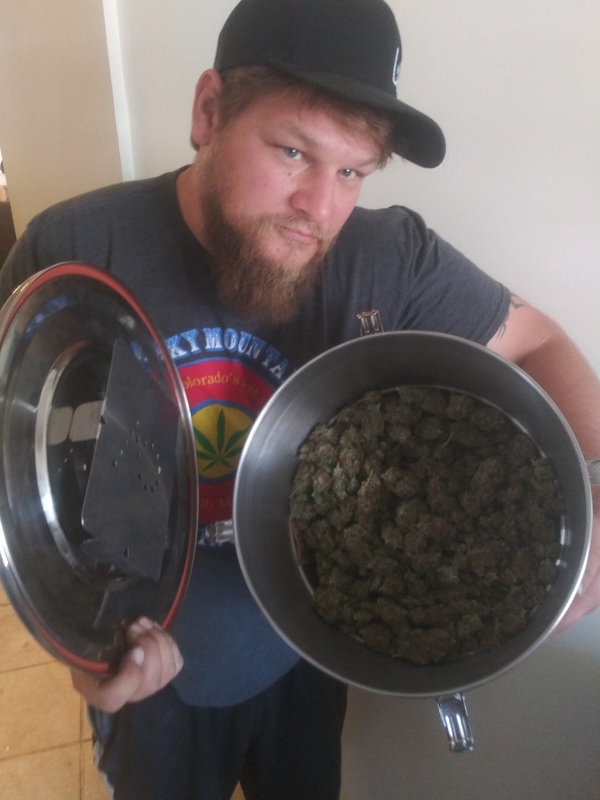 In my experience, the buds will keep getting better and seem to really peak around 6-8 weeks; I did have one jar sit and cure for 11 months and it was incredible (it kept getting better), but my yields have been lower lately so I haven’t had enough to really let it cure before I use it. I just recently bought a smaller c-vault (2 liter) to give a try… I haven’t had it long enough to get a batch cured in it, but I’m giving it a go to see how it compares. I use colored mason jars for storing cannabis to be used with-in a week or so, I vacuum seal the rest and store it in a dark cool area, I have found that the old freezer storage-even vacuum sealed-has flaws for letting some crystallized water happen, so just keeping it stored in a dry cool place has yielded better results, if you wrap your colored mason jars in some sort of light protection, you can get a better shelf life. If you haven’t cured and dried properly and seal it in a mason jar with-out opening occasionally to get some fresh air, your cannabis will mold, that was a learning experience you don’t want to make!